Gas Cutoff Saw Details - Quasius Equipment, Inc. The Gas Cutoff Saw is a portable saw powered by a two-cycle gasoline powered engine. 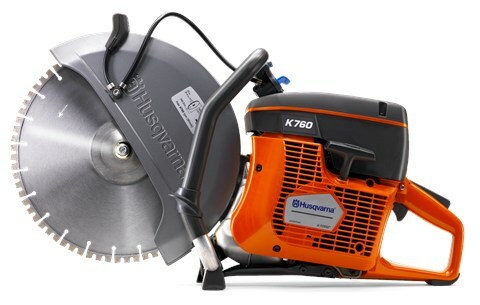 Its blend of light weight and high power make it a fast cutting saw that can adapt to almost any cutting situation. It features a 14" diameter blade, which can cut to a maximum depth of 4.5". Because it's powered by a gasoline motor it's not to be used in confined spaces like basements due to carbon monoxide poisoning. The 2-cycle gas engine requires fuel that has oil mixed with it, but we'll supply all the fuel you need at no extra charge. It can be used to cut a number of materials. Both abrasive and diamond blades are available for cutting concrete and masonry products. Abrasive blades are available for cutting steel or ductile iron and there are also carbide tipped blades that can be used to go through shingled wooden roofs and other nail-imbedded materials, such as walls, for demolition work. Diamond blades can also be purchased or rented for concrete cutting. The advantage of the diamond blade is that it's narrower so it cuts faster and produces less dust. It also retains its full diameter unlike abrasive blades which wear down as they are used, so your depth of cut will be more consistent with a diamond blade. To access the diamond blade info page click here.